Fans of highly-simplified, classic fruit machines might get a kick out of this take on the traditional slot machine. 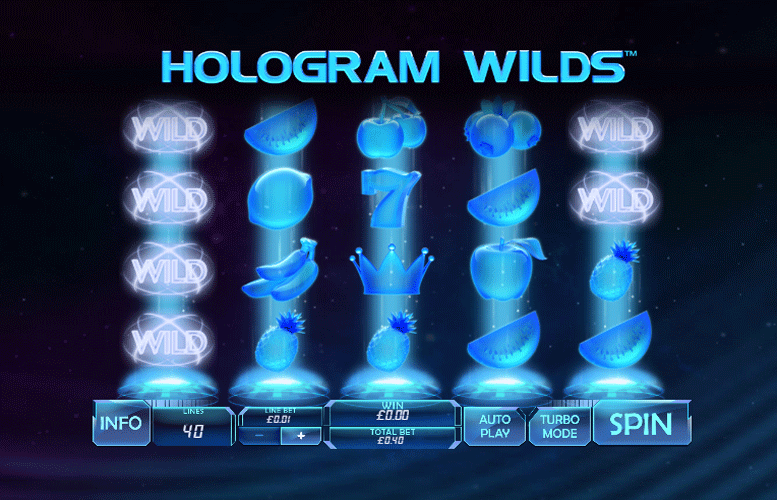 Hologram Wilds from Playtech features five reels, three rows, and 40 pay lines. All the typical symbols you’d expect to see on an old school machine are present. These include: cherries, lucky sevens, watermelons, and pears. Unfortunately, a lack of features and a weird blue colour scheme really let the game down. There isn’t a lot to love about it. Meanwhile, there is a lot to put players off. Take the upper betting limit of £16, for example. This seems a bizarre inclusion on a slot that doesn’t even have that high a return-to-player rating. Classic fruit machine aesthetic might appeal to some. We’re clutching at straws here, however. Ridiculously low upper betting limit. It will be more than just high rollers who are put off from playing Hologram Wilds. Weird colour scheme. Most slots have symbols that are completely different from one another. With an ethereal blue wash over all the symbols on Hologram Wilds, it makes it difficult to see at a glance if you’re on for a big win. This seriously detracts from both gameplay and aesthetic appeal. Lack of features. With just a single free spin mode to excite players, Hologram Wilds struggles badly in the action department. Seven = 400x the line bet. Plum, Banana, or Watermelon = 250x the line bet. 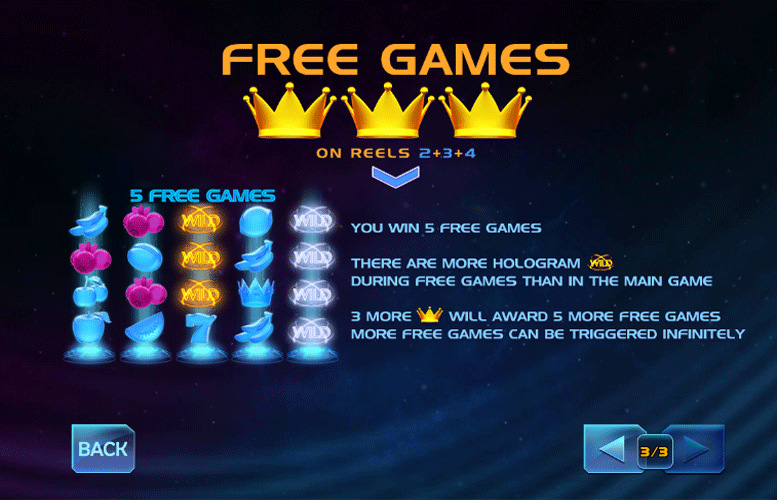 Landing the crown “scatter” symbol anywhere on reels two, three, or four will trigger five free games. 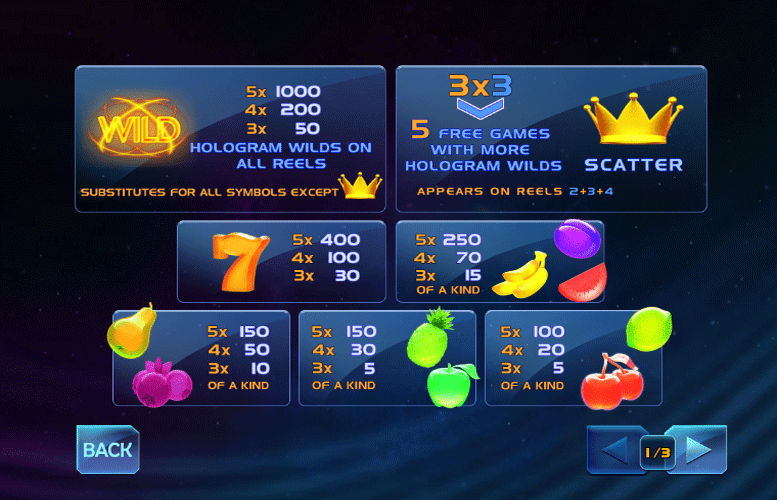 During these free spins, additional Hologram “wilds” are added to the reels. This, of course, means that there are even more chances to win during free spins. What’s more, if players are fortunate enough to land an extra three “scatter” symbols on the reels, they’ll retrigger the free spins. This dynamic can occur indefinitely too. Pear, Grapes, Pineapple, or Apple = 150x the line bet. Lime, or Cherries = 100x the line bet. 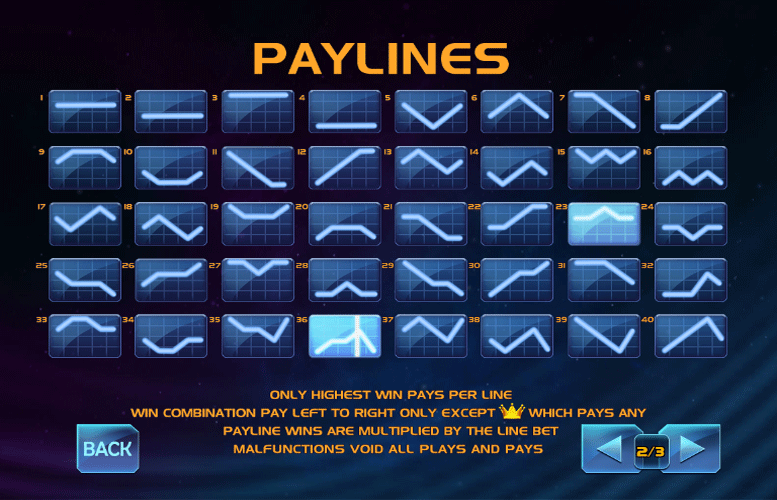 The number of win lines is fixed at 40 on Hologram Wilds. This means that players can only alter how much is bet per line. The minimum value here is just 1p. Meanwhile, the maximum is an underwhelming 40p. This means that with all values set to their minimum, the lowest possible bet per spin is 40p. Conversely, with everything maxed out, the highest possible bet is a hugely unexciting £16. We often grumble about the low betting limits on some slots but Hologram Wilds might take the prize for the stingiest around. We’re far from enamoured with Hologram Wilds from Playtech. It’s clearly an attempt to modernise the classic fruit machine. However, it falls short of the mark in several respects. How a player is supposed to enjoy playing with the bizarre blue symbols on an all blue background is unclear. When this is coupled with the lack of bonus features and the measly upper betting limit, it’s obvious that Playtech should take Hologram Wilds back to the drawing board. This game has a rating of 3 / 5 with 315 total reviews by the users.